We’re happy, proud, excited, nay – Thrilled; to announce that we have officially launched Ron Dorris Electric. Ron Dorris Electric came to us with a few interesting challenges. The existing site was built completely on static, outdated HTML structure, despite having upwards of 100 pages of content, not only that but it was search engine optimized and had a ton of sections that needed to be re-created. We converted them to a fast, fluid and responsive web design that works on mobile devices (iphones etc) – we re-created their content page for page as wordpress ‘posts’ with categories. Which means each section of the site was now represented by a category and each page within that was handled as a blog post. To search engines this is largely the same but for managing and maintaining these dozens of pages this was a massive improvement. Now each section of the site is clearly defined, clearly separated and most importantly, easily updated and maintained. 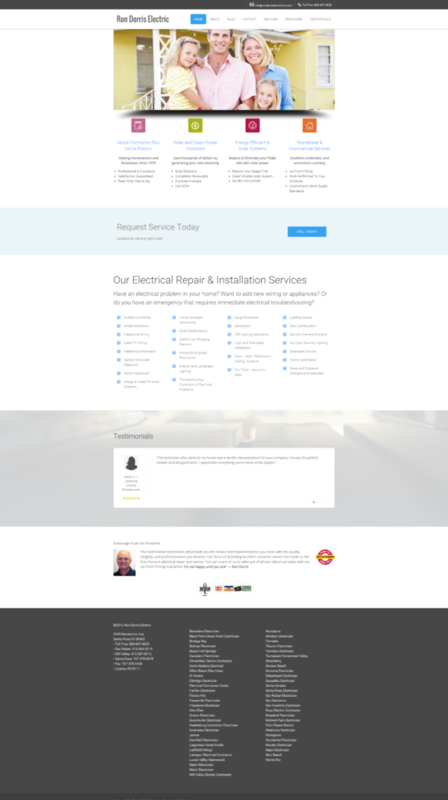 The re-design is a clear win for Ron Dorris Electric and while embracing modern coding and technologies they also get to simplify their lives, make updates to the site themselves and… it looks great. A full service electrical contractor serving Sonoma County, Marin County and Napa County. Since 1978 we have been approaching homeowners with the specific intent of creating trust. By consistently performing in a manner that distinguishes us from our competition, we demonstrate our planning expertise, provide the customer service we promise, and prove that our client is the most important member of our business.